The South Sudan Youth Sports Association (SSYSA) has developed a holistic approach of counseling, provision of food and educational support, and empowerment efforts towards girls and young women. In addition, participants take part in clean environment activities, gardening for food. SSYSA involves participants in all of its activities, including decision-making processes. Furthermore, they are trained to become coaches for a future leading role in the organisation’s development. 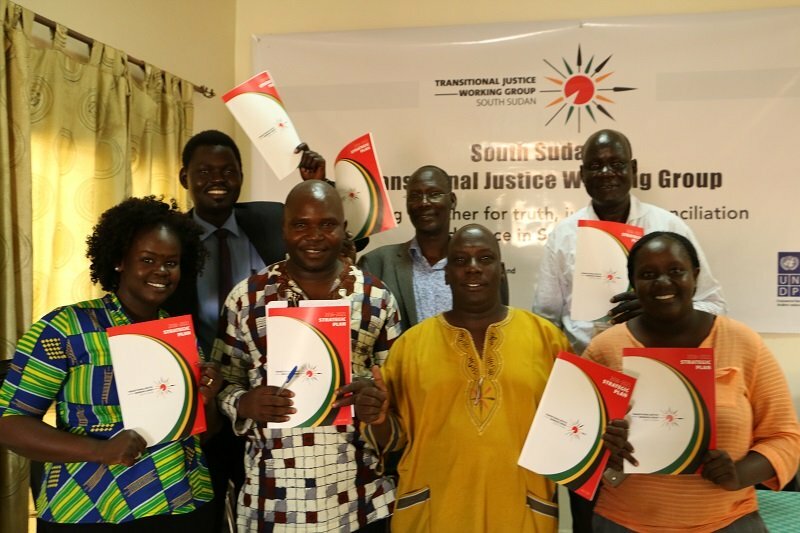 The Transitional Justice Working Group (TJWG) – a coalition of civil society organisations – is pleased to invite you to the launch of their forum on Monday 24th April 2017 at Juba Grand Hotel from 2:00 – 5:00 pm. This forum is under the theme: “Prospects for Transitional Justice in South Sudan”. SSWEN Transitional Justice Program Officer, Josephine Doru, meets Kator Payam Quarter Council to discuss civic education on Chapter 5 of the Peace Agreement and conducting Public Consultations with communities on their prospects on Transitional Justice. The consultations will be on the three mechanisms stipulated in the agreement - namely, Commission for Truth Reconciliation and Healing (CTRH), the Compensation and Reparations Authority (CRA) and the Hybrid Court for South Sudan (HCSS). This project is funded by the Norwegian People's Aid (NPA). It's going bigger and wider than last year... most of the participants who are marching are in white... we women we are begging for peace that will bring us all together. "Be Bold for change" is not only for women but also our men should contribute and engage to our right because without it we will not have complete peace. The theme for International Women’s Day, 8 March 2017, is “Women in the Changing World of Work: Planet 50-50 by 2030”. The world of work is changing, with significant implications for women. Globalization and technological changes bring unprecedented opportunities. But the growing informality of labour, unstable livelihoods and incomes, and new fiscal and trade policies also impact women’s economic empowerment. Following the last post about the radio talk-show that is happening now at Radio Bakhita. The theme and point of discussion: " How Transitional Justice, accountability and Reconciliation can end risk of re occurrence of conflict in South Sudan". SSWEN Is now discussing about Transitional Justice. "When you rise in the morning, give thanks for the light, for your life, for your strength. Give thanks for your food and for the joy of living. If you see no reason to give thanks, the fault lies in yourself". Greetings from SSWEN Team and Have a great week ahead! There is no time more fitting to say "Thank you" and to wish you a happy holiday season and new year oh health, happiness and prosperity. A nation that has justice to everyone equally and can bring all the criminals and perpetrator to justice, can be a peaceful nation with a peaceful co-existence. SSWEN with the support of NPA on Transitional Justice Project in Juba after the inception meetings with the local authorities conducted a training on SGBV documentation bringing together participant from different backgrounds with a vision on how to make South Sudan a better place to live and free from Sexual and Gender Based Violence and justice to be done to all equally.